As well as being busy with events over the back end of the summer, we've also been here there and everywhere, making new friends, researching new ideas and making progress on the big restaurant search! Now the seasons are changing, (and it's getting much colder!) Dan has been experimenting with some delicious local produce, travelling across Norfolk to source the best game and seasonal vegetables. From wood pigeon and venison to Jerusalem artichokes and celeriac, we absolutely love this time of year and the comforting flavours of Autumn & Winter. Dan is passionate about using old fashion cuts of meat, cooking methods and flavours - bringing them to life with modern techniques, presentation and a few little tricks he has up his sleeve. Nat's favourite to nibble on is a newly developed drinking snack - Wood pigeon glazed in a cinnamon and star anise spiced jus, coated in an almond and pine nut panko with a heritage carrot puree - it really is heavenly! We hate to mention the C word this early on in the game, but with Christmas plans getting well underway, why not consider using Socius to cater for your festive celebrations? Whether at home or in the office, we can cater for all private and corporate events. As well as experimenting in the kitchen, we've also been on a number of research trips around the Norfolk county and further afield, including a recent trip to the Big Smoke! As our search for the restaurant premises is hotting up (we really can't tell you yet but we promise it won't be long! ), our trip to London was filled with tube journeys across the capital to be inspired by interior design, new crockery, glassware and a few cheeky tipples here and there (well we have to research new drink trends!). Whilst we were there, in order to soak up some of the drinks, we ate some amazing street food as well as visiting Temper Soho, an open BBQ and fire pit restaurant - our favourite dish was the smoked goat shoulder flatbread (We're still thinking about it now...). These research trips are more professional than they sound (we promise!) - we take a huge amount of inspiration from everywhere that we've been, from London to New York and Sydney to San Francisco. Our restaurant, Socius, will be inspired from everywhere that we've been, whilst keeping Norfolk and it's local produce at the heart and soul of what we do. We can't wait to share this with you! We're so lucky to have such a fantastic team around us at the moment, and we really would like to say a huge thanks to all of our staff - we wouldn't be here without you all! 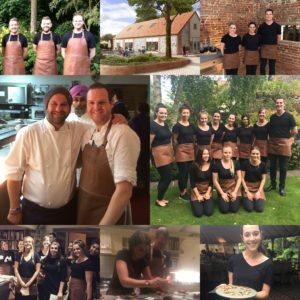 We are always on the look-out for new staff to join our ever-growing team (especially once the restaurant opens! ), so if you think you've got what it takes to become part of our Socius family, please do get in touch! We promise that the next time we write a blog we'll tell you all of our secrets, where and when we will be opening - so watch this space!! We really really look forward to your opening in Burnham Market…….the sooner the better as we can make our village the foodie capital of the East.